This recipe was concocted whilst I was somewhat dozy one Sunday morning (although it’s been subsequently checked and is right, don’t worry), so it definitely counts as an original recipe for The Usual Saucepans. It takes under 30 minutes to make (including resting time) and will feed two. Serving suggestion: raspberries, yoghurt and coffee. Lots of coffee. Whisk together the milk and the egg, then slowly whisk in the salt and flour. Once there are no lumps of flour, mix in the peanut butter until the mixture is smooth. It will be quite runny. Set aside to rest for 15-20 minutes. Put a non-stick crêpe pan on the hob (or a flat frying pan/skillet) on a medium heat and let it get hot. Stir your batter a little to ensure nothing’s settled. 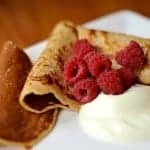 Get a spoon and make a mini test crêpe – the first one is never ‘quite right’ – which you can then eat whilst cooking the rest. You probably want the equivalent of 2 tablespoons worth of batter for each little pancake. Pour on and rotate the pan a little to spread it out evenly. Cook until the little air bubbles on the top start to appear and burst, then flip and cook on the other side for 20-30 seconds (depending on pan heat) before checking to see if it’s cooked. These are thin, so will cook quickly. Lay to one side (I had mine on a clean dish towel on a cooling rack) and move on to the next one. If your pan is big enough you can do two at once, just use the back of the spoon to spread the mixture out in the pan. Serve as soon as the last one is cooked.